Orthodox Christians see their church as the historic church, because it is the continuation of the church found in the New Testament. It holds the Bible to be the inspired word of God and interprets the Scriptures using the historical context that we call Tradition. The church is located in Cleveland Heights, in close proximity to Case Western Reserve University, John Carroll University, University Hospitals and the Cleveland Clinic. The cultural center of Cleveland, University Circle, is a short drive down the street. Its members live mainly on the east side of Cleveland, Ohio and in the eastern suburbs. We invite you to learn about our parish both through this website and by coming to see us. 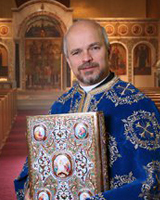 Our Sunday worship service, known as the Divine Liturgy, is celebrated every Sunday at 9:30 am. We look forward to meeting you! Click on the links below to read past sermons.